Sharon Burgess and Donna Messel. They have two grandchildren Catherine and Robert. Harry has worked for the Parkdale Construction Co. in Brandon for the past thirty years. A lover of music, he has been a member of the Brandon Barbershoppers for the past eight years. Both Harry and Gladys are active members of Redeemer Lutheran Church in Brandon and serve on the church council. Mildred Mabel, born January 22, 1927, and raised on her father's farm, attending school at Nedrob and Erickson. Mildred, as a young girl, worked in Minnedosa at the Post-Office and later at the E. Stevens Pharmacy. Mildred married Harold Stitt of Erickson. (refer to Stitt, Harold and Mildred). Ellen Pauline, was born at the home of her parents and she too was educated at Nedrob. Ellen was known as "Tiny Tim" as a little girl. She worked at the Portage Fruit Home in Winnipeg, Manitoba, before marrying Ernie Johnson on January 10, 1951. Ellen moved to Kitimat with her husband and two small children where they have lived for the past 25 years. Ellen and Ernest have three children Alfie, Paul and Catherine. Russell Tiller Family. Left to Right: Susan, Dennis, Russell, Kaye, Kelvin and Kenneth. children received their education at Erickson Elementary and Collegiate. Susan, born March 22, 1959, graduated in 1977 and is employed with the Alberta Government. 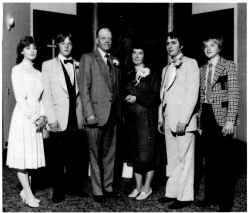 On July 30, 1983, Susan and Kevin Kliss of Edmonton were married. They are employed and reside in Edmonton, Alberta. Kelvin, born August 25, 1960, and graduated from Erickson Collegiate in 1978. He married Susan Hanishewski of Clanwilliam in September, 1982. They reside at Hamiota, Manitoba, where Kelvin is employed as an Agent for Manitoba Crop Insurance and Susan, a Hairdresser. Kelvin and Susan enjoy snowmobiling. Dennis, born May 6, 1963. He graduated as a Heavy Duty Mechanic from Assiniboine Community College, Brandon, and resides on the farm, helping his father. Kenneth, born August 13, 1968, and is presently at­ tending Erickson Collegiate. Editor's Note: Russell was elected Reeve of the R.M. of Clanwilliam in October, 1983. Adolphe came to Canada and the Rural Municipality of Clanwilliam with the Miller family in the early 1900's. 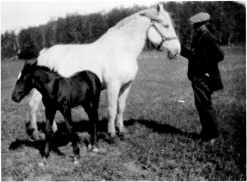 His first years in Canada were associated with the Miller and Haralson families. In 1920, he bought property from Peter Abel, 44 acres lying south and west of Railway on S.W. 32-17-18W. He built a house, a big barn, machine shed, hen house and hog shelter combined and carried on farming on a small scale for many years. He also worked in the sawmills hauling logs in the winter. Adolphe had a great love for horses and always prided himself in having a good fast team. The last beautiful team he had, he called Don and Fly.